A promising young apothecary picks up the pieces of her life, only to collide with the ruthless thief-taker who once shattered her dreams and her heart. When the love of his life chose an apprenticeship in Scotland over his marriage proposal, thief-taker Cameron Adair buried himself in his work--building an unmatched network of underworld spies. Forged by his reputation as a ruthless, greed-driven businessman, he has amassed a fortune. But he has one vulnerable spot in his armor--a brilliant, green-eyed apothecary, who continues to haunt his heart. When a murder investigation brings him back into contact with Charlotte Fielding, Cameron sets aside the past to find a killer and to distract a headstrong apothecary, clue by clue, kiss by kiss. From the moment I wrote Cam and Charley’s short scene in A Lady’s Secret Weapon, I knew I had to explore why these two seemed so uncomfortable in each other’s presence. What a surprise to learn they would get their own romantic mystery series! While researching this novel, I could find no evidence that female apothecaries (or apothecary-surgeons) existed in history. But I believe much of our true history never reaches the written page. Women tend to be caretakers by nature. To say with absolute conviction that no female apothecaries existed in our past, stretches my belief system. What if no one had ever written about Cleopatra, Joan of Arc, Florence Nightingale, Rosa Parks, Jane Goodall, Malala Yousafzai, and so many more? If no one had written about these courageous, trailblazing women, would that mean they never existed? I believe history is full of women and men who stepped outside of society’s confining box to make a difference. Plus, part of the fun of reading fiction is to escape to a different world. 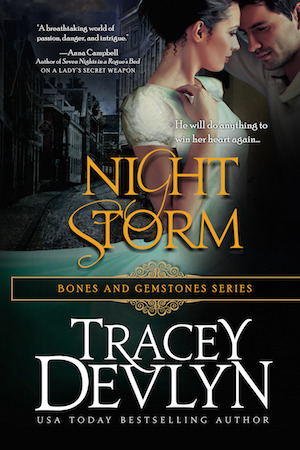 In my Bones and Gemstones world, a woman can be an apothecary-surgeon in 1804 London. As a VIP, you'll get access to exclusive content, new release notifications, behind-the-scenes peeks into my writing and whatever general, all-around goofiness is going on in my life.